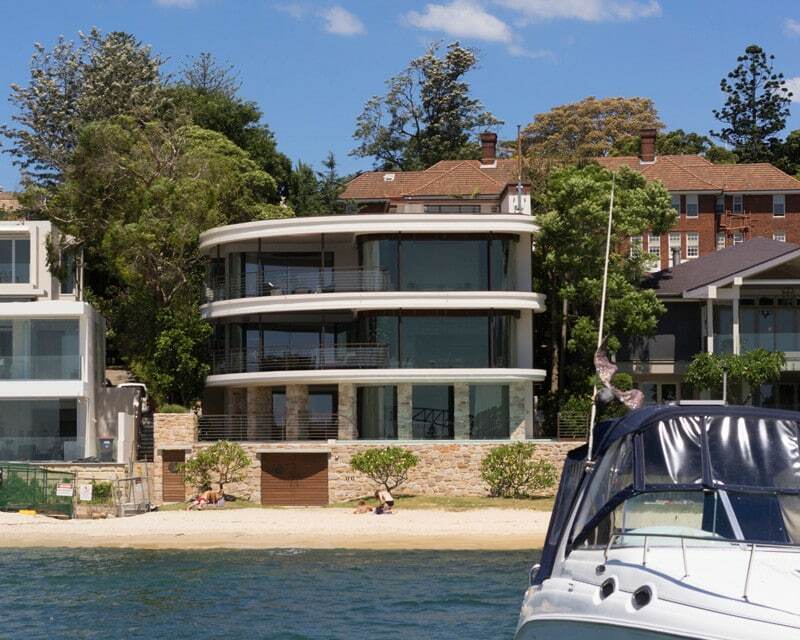 It is quite rare, in Woollahra Council’s municipality, to have a waterfront residence so close to the water. One gets the feeling of being in Sydney Harbour when looking out of the over-sized wafer-thin framed windows. 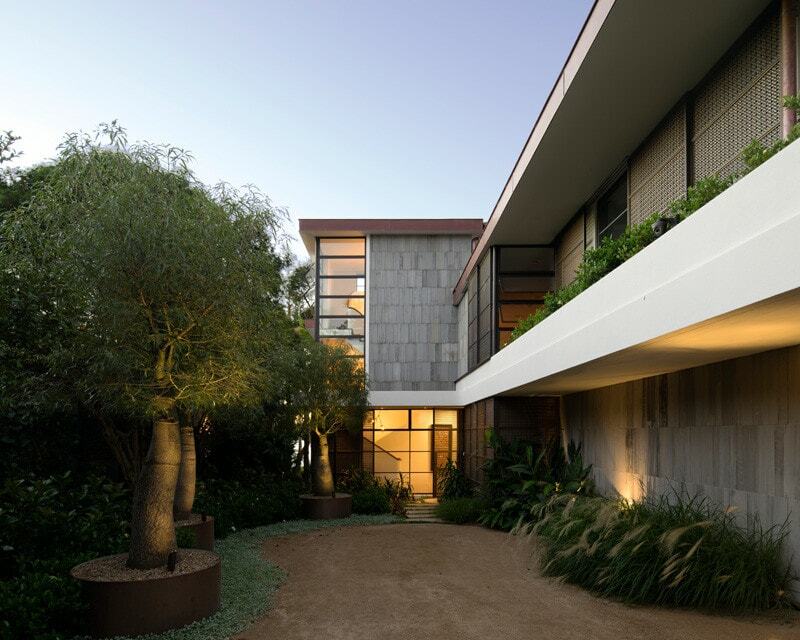 Luigi Rosselli Architects won a limited architectural competition to develop the site by proposing to revive the existing three storey house while the competitors opted for a clean slate solution. 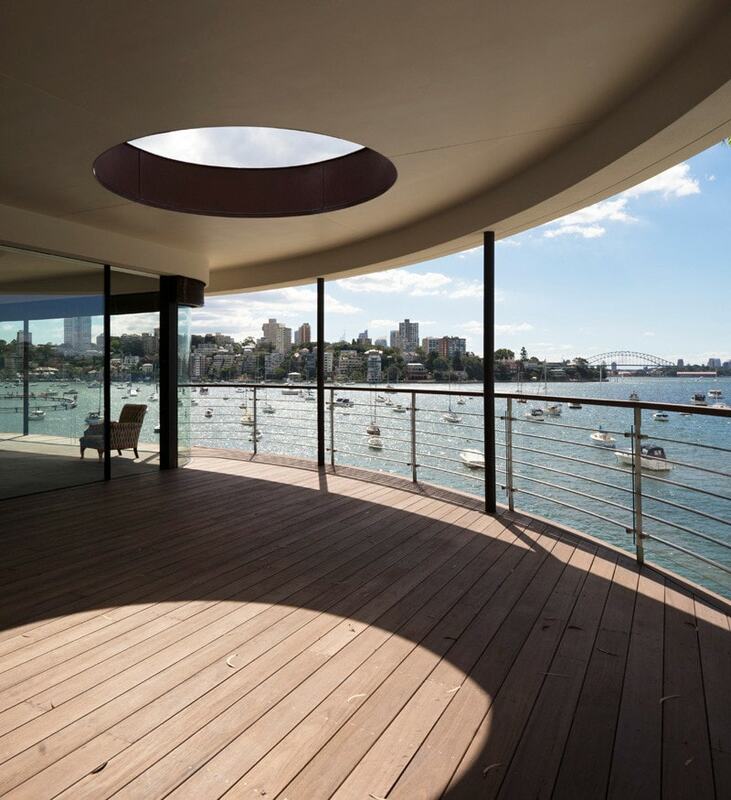 Adaptive reuse is the best way to keep a carbon footprint small and the strategy was rewarded in this waterfront property by maintaining the foreshore building line just a few steps from the water. A new house would have to be set further back. 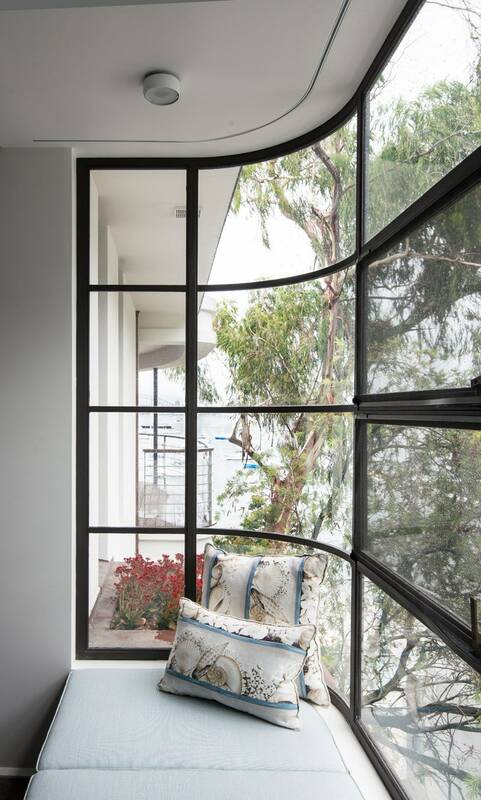 A copper rimmed hole was cut into the flat roof to bring light and air to a deep terrace. The landscaper delivered, by crane, three frangipani trees to soften the sea wall. Brass boat portholes are cut into the gate and the boathouse doors. 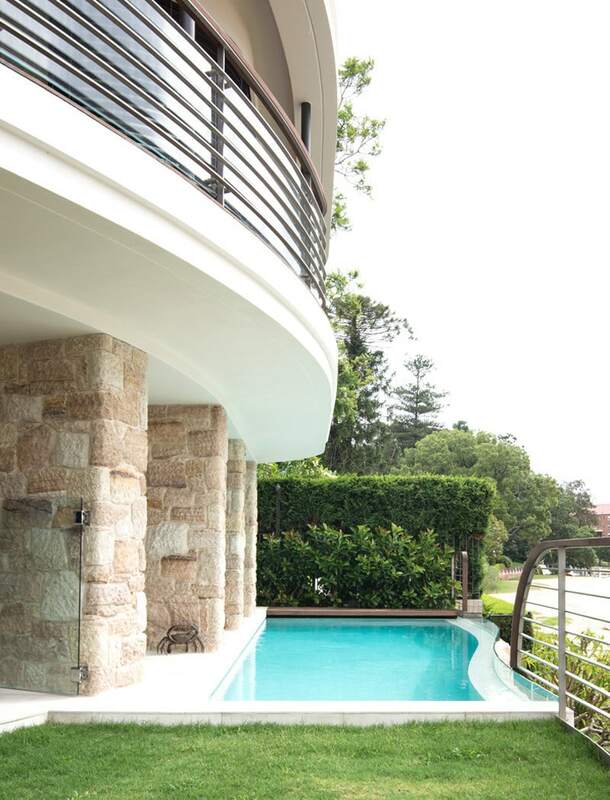 The bead blasted stainless steel balcony railings are a nautical reference to the naval architecture of the 1930s. 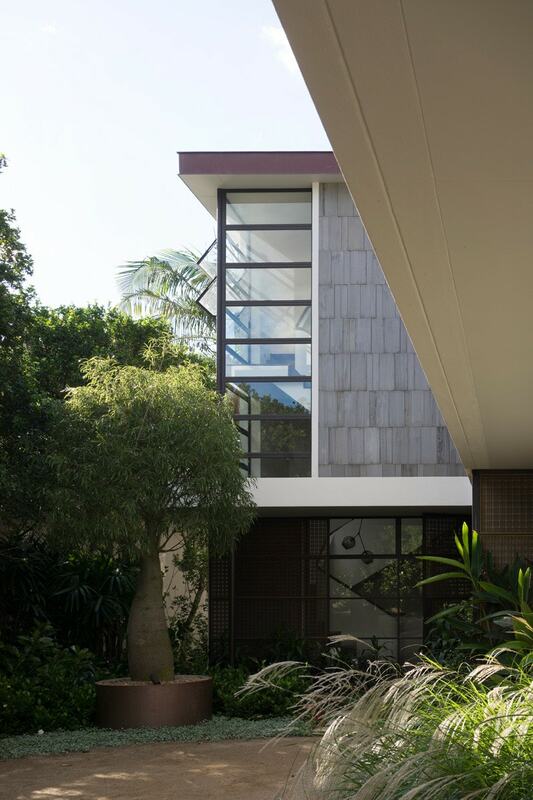 the low iron glass behind it is to satisfy the Building Code of Australia. 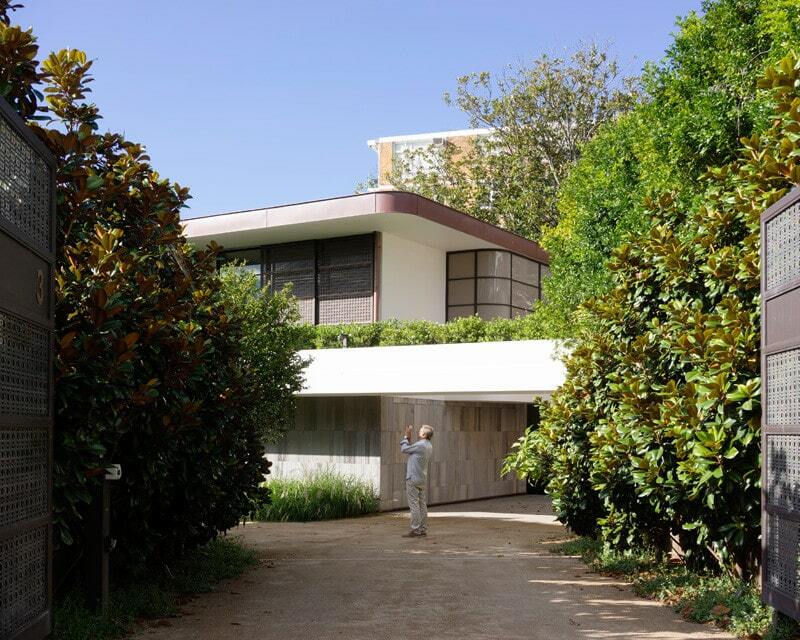 The gravelled entry drive splits to the garage on the right and the entry court on the left. 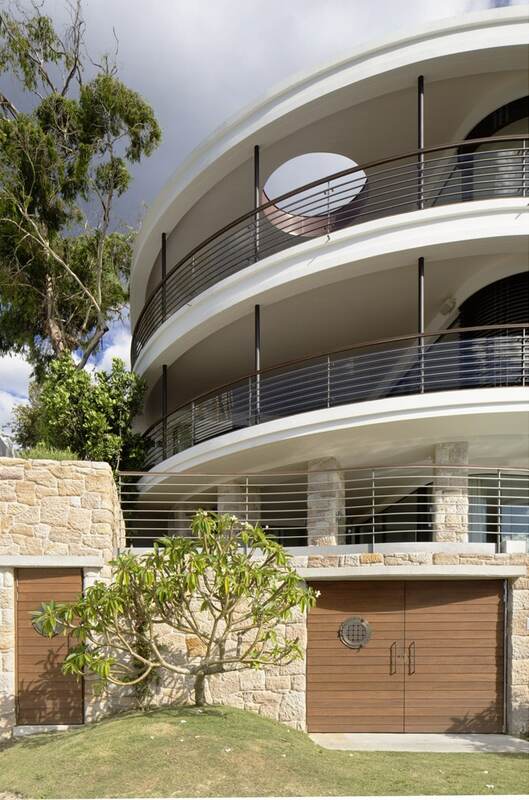 The timber wall cladding conceals a garage door and the old brick façade of the house. Built only a few years after Walter Gropius’ s Fagus factory with its famous glass stairs, this stair tower now extends to the roof terrace with new steel windows. 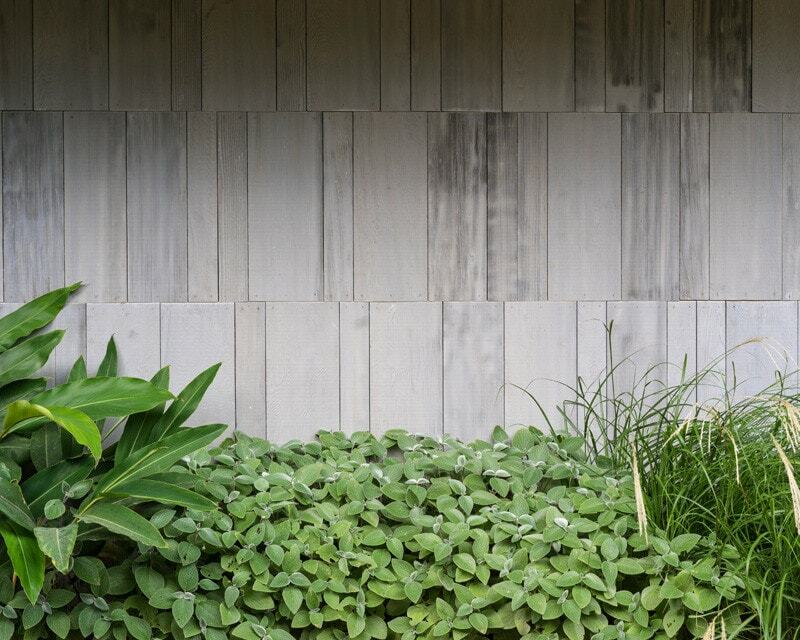 The wall cladding is composed of three sizes of western red cedar panels with a Porter’s grey timber stain, specially mixed for the project. 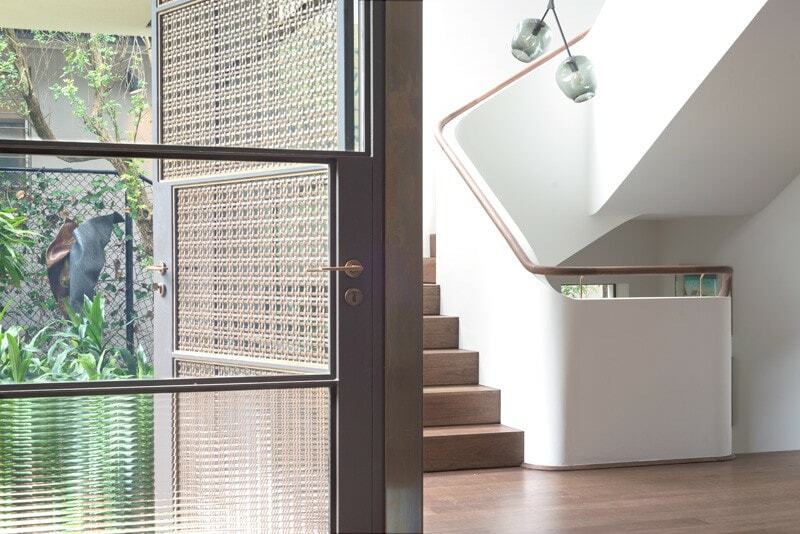 Steel windows and woven brass screens provide an open feeling and privacy as well. 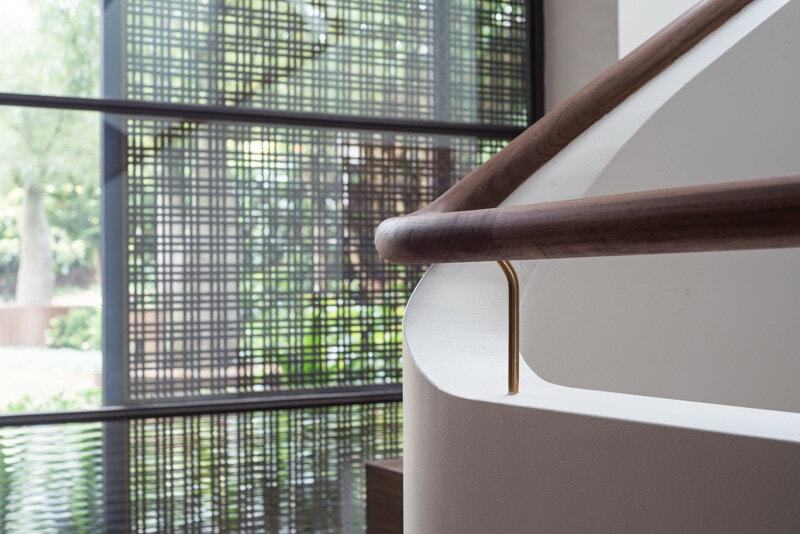 A timber handrail and masonry parapet follow the stair effortlessly, as if they had been formed with modelling clay. 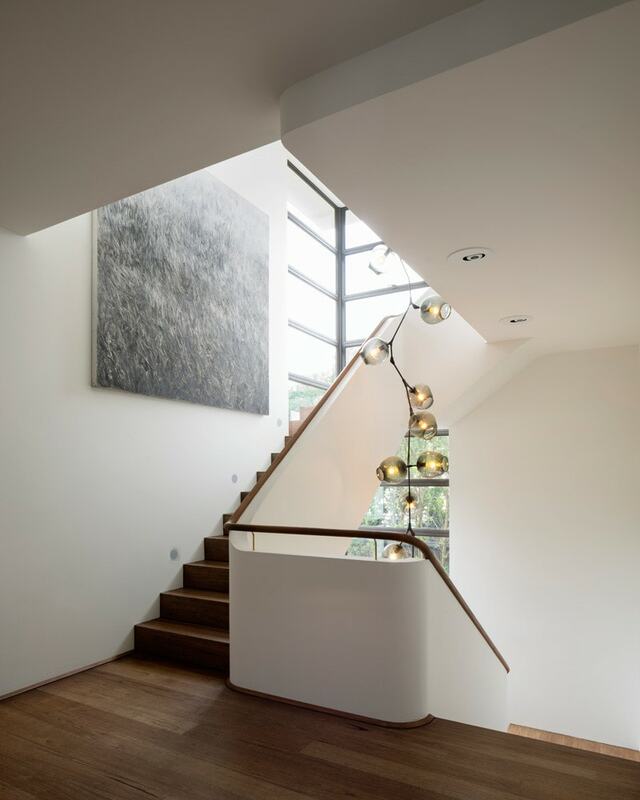 The seven metre tall Lindsey Adelman chandelier dominates the stairwell. 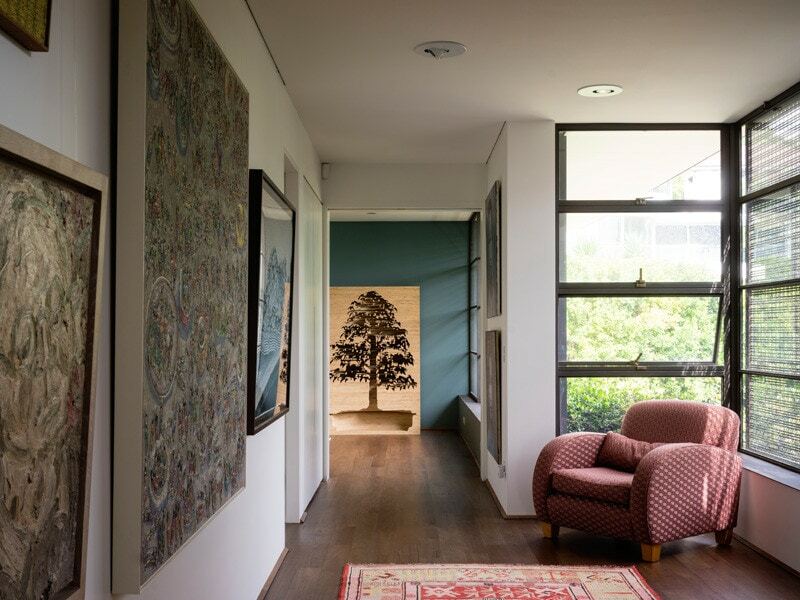 Light projectors, concealed in the suspended ceiling, illuminate the artwork. 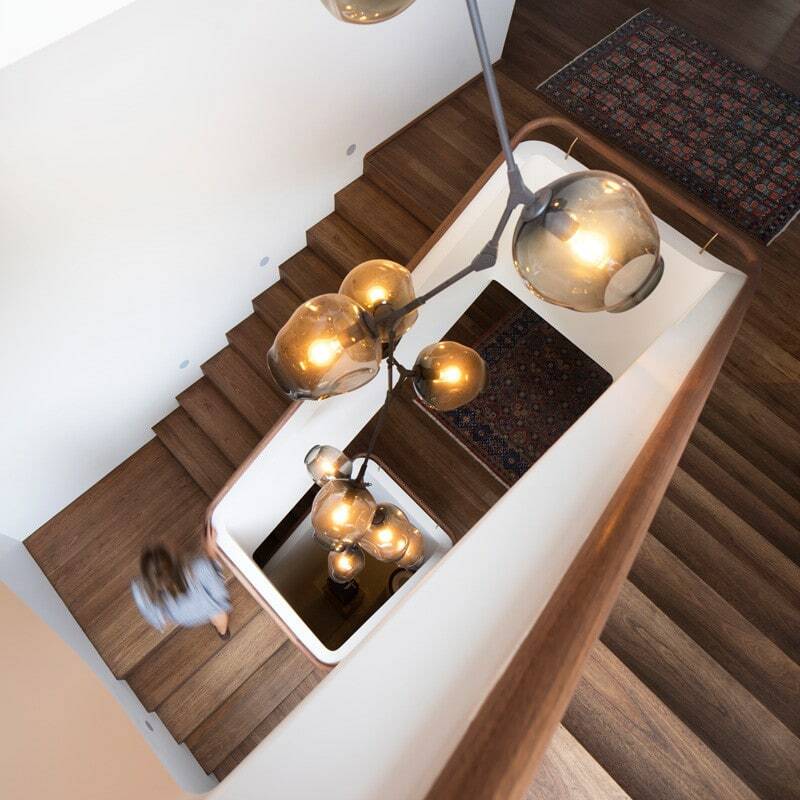 Four storeys high, the stair has a solid Blackbutt hardwood finish, with a moderate stain finish. 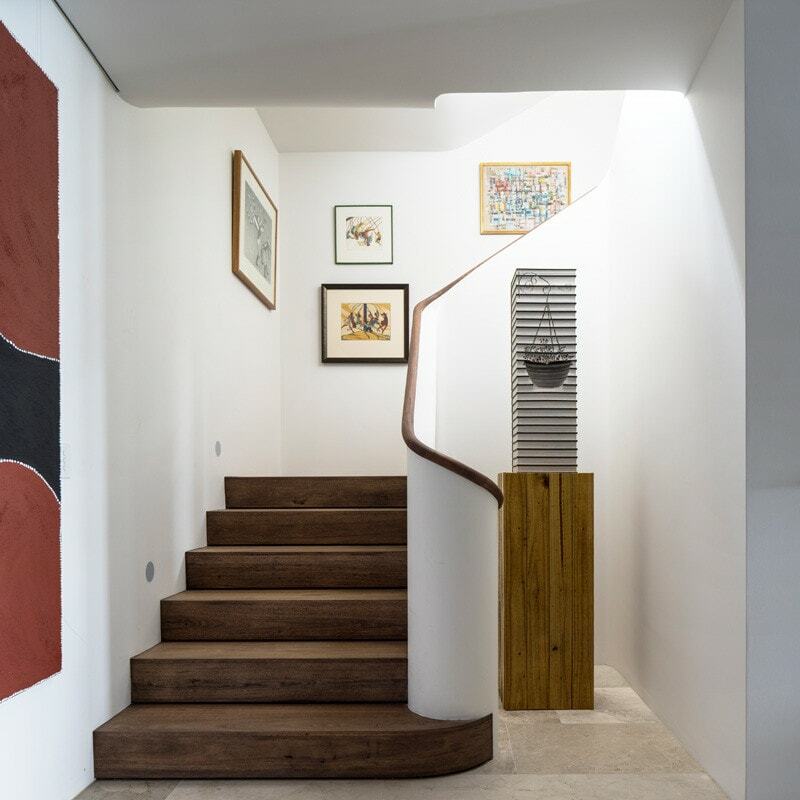 The vertical gallery of paintings terminates at the bottom of the stairs with a sculpture. 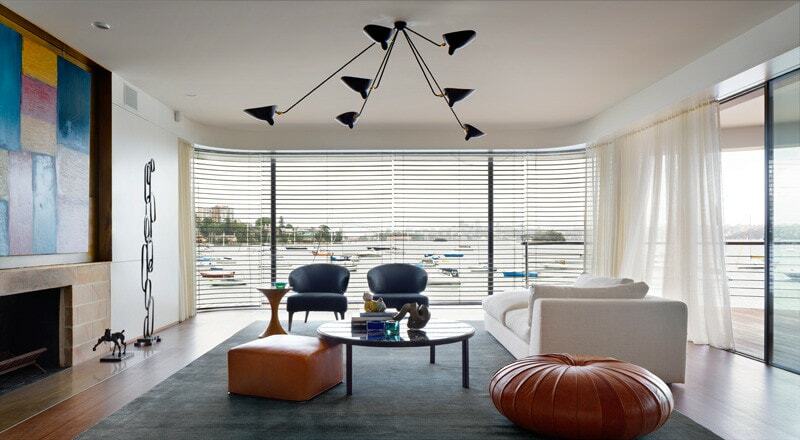 Nearly floating in Double Bay and Sydney Harbour, the living room is a collection of furniture classics, lighting icons and worldly artwork. 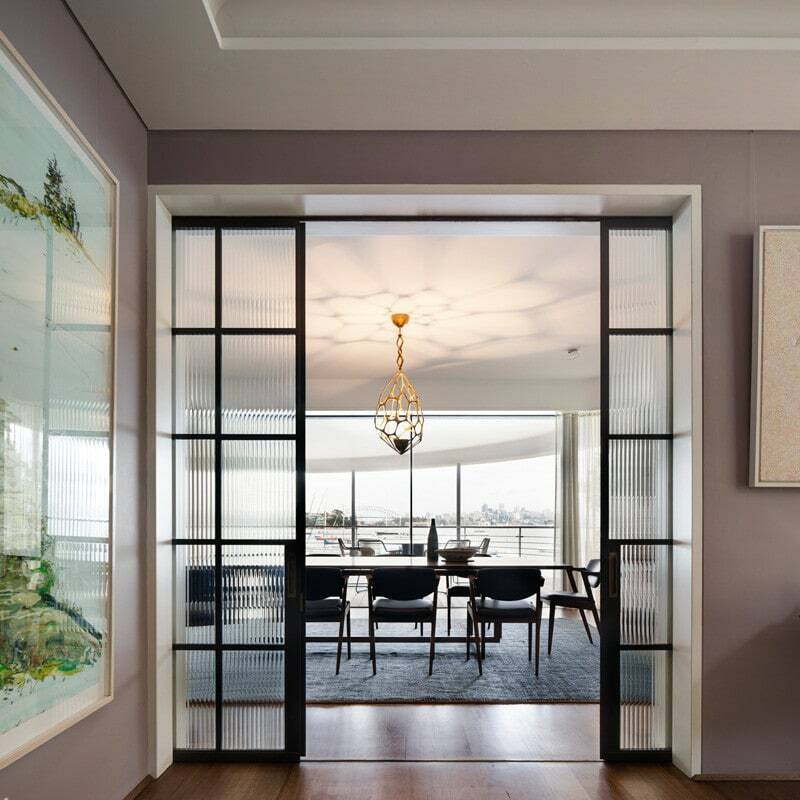 Brasilian ribbed glass in steel framed doors frame the jewellery inspired Herve van der Straeten lustre. 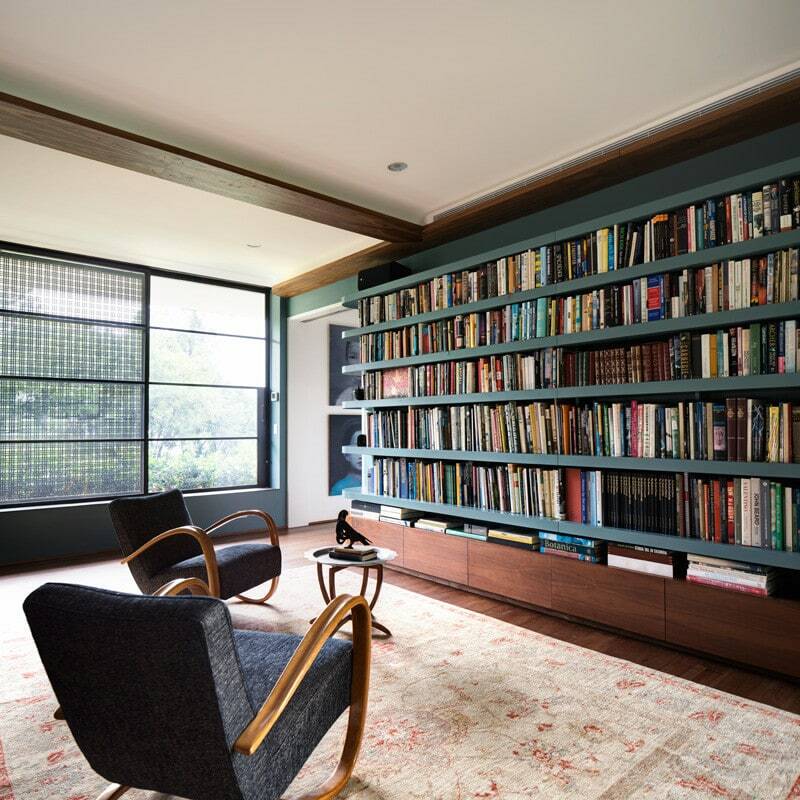 1930s Halabala [ www.designaddict.com/atlas/designers/Jindrich-Halabala/ ] reading chairs contemplate the densely packed library. 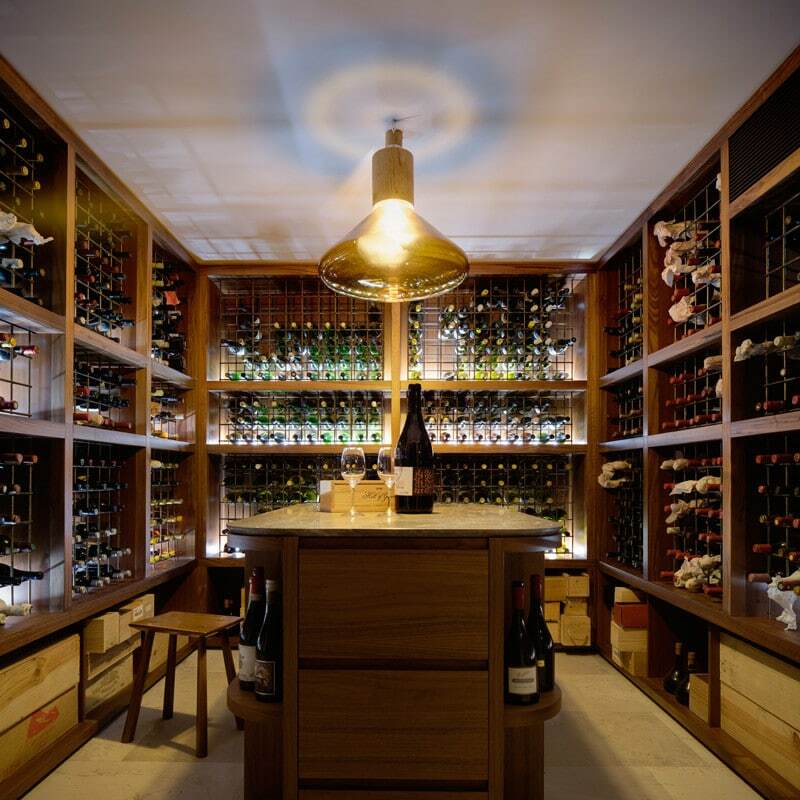 The horizontal gallery accessorised with painting suspension rails and flush ceiling light projectors. 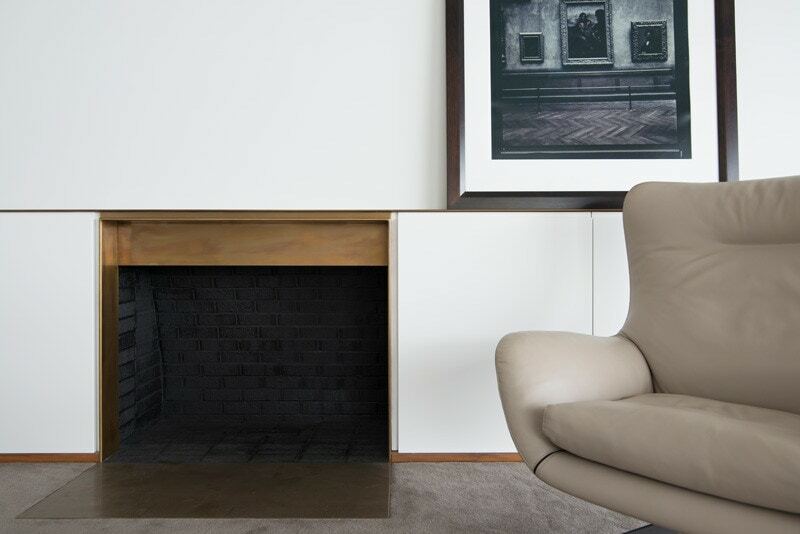 In the master bedroom, surrounded by a bronze finish brass mantelpiece, a discrete fireplace is a counterpoint to the frameless glass wall facing the Sydney Harbour. 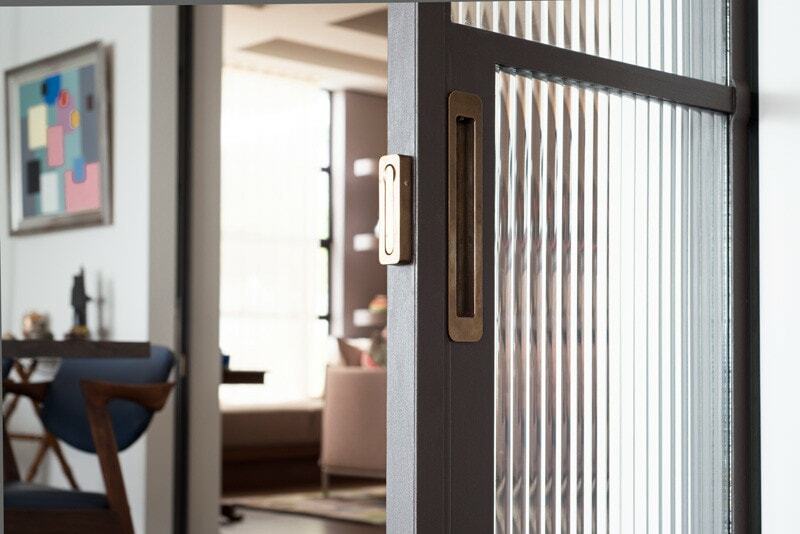 Bronze finish hardware on micaceous painted steel doors. 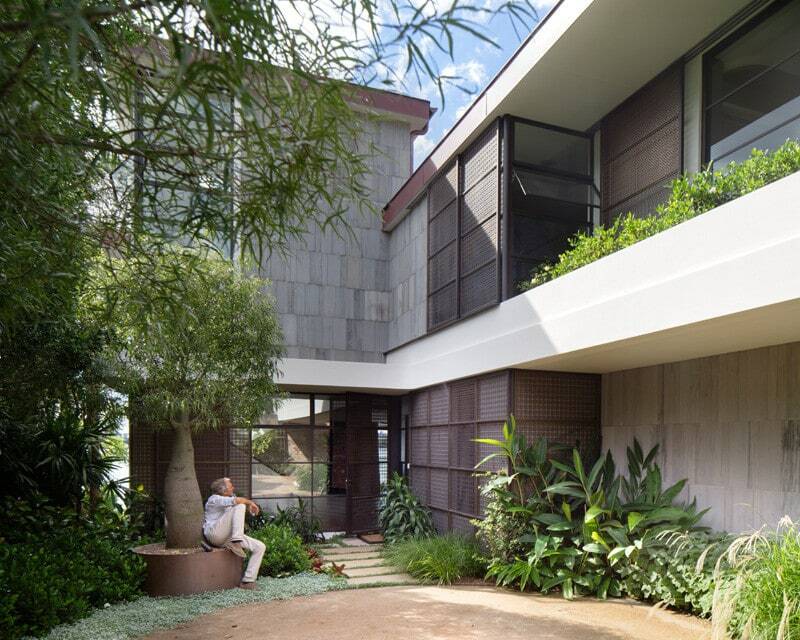 Narrowline glass imported from Brasil. 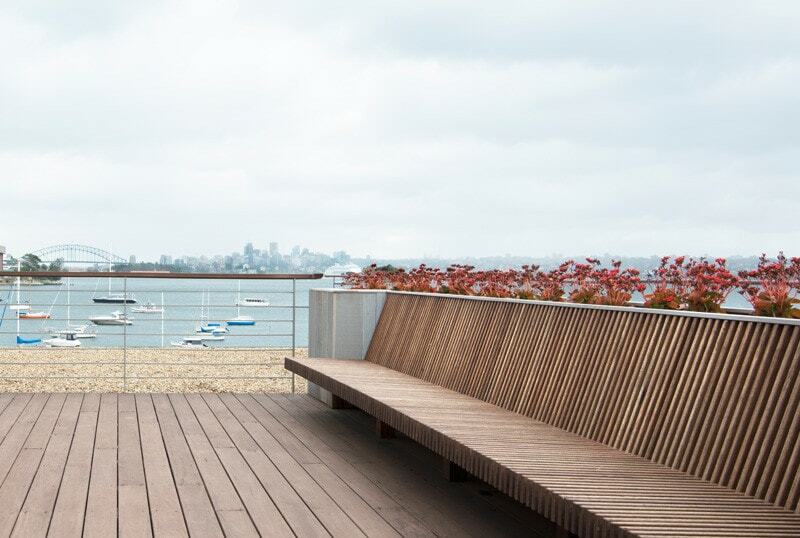 The seat made of hardwood decking board ready for the frequent fireworks over Sydney Harbour.